According to the Los Angeles Times, Into the Woods just outpaced Unbroken for second place at the weekend box office. Woods took in $46.14 million since its opening Christmas day, just ahead of Unbroken at $46.05 million (despite the former showing in nearly 700 fewer theaters). Early estimates suggested that Into the Woods would fall slightly short of Unbroken, but it obviously turned out being the other way around. The final installment of The Hobbit led both films to bring its two week-gross to an impressive $168 million. At long last, Into the Woods opened nationwide yesterday and I was fortunate to catch a 9:15 showing last night. Joe has had the original Broadway recording committed to memory for fifteen years, and he was nervous going in, hoping not to be disappointed by this adaptation. I wasn't too anxious, as I knew it was getting positive reviews and figured it couldn't be terrible. Regardless, I was happy when Joe, our friend Scooter and I finally arrived at our seats in the packed theater. I've been posting so much about this film in the past year that I'm not going to go crazy describing the intricate plot. For the most part, it remained very faithful to the original stage production, with necessary omissions to keep the film's running time around two hours. The story is narrated by The Baker, and follows the actions of famous fairy tale characters in their intertwined quest to fulfill their "wishes." But unlike most fairy tales, after these characters ultimately get what they want, it's not necessarily 'happily ever after'. Meryl of course plays the Witch, who places a curse on the Baker (James Corden) and his wife (Emily Blunt), as retribution for the Baker's father having stolen from the Witch's garden many years earlier. The Witch's mother curses the Witch in turn for having lost the most prized item in the garden, magic beans, and transforms her from a beautiful woman into an old hag. If the Witch can make a potion out of four items: 1) a white cow, 2) a golden slipper, 3) yellow hair and 4) a red cape, she will regain her beauty and reverse the curse on the Baker and his wife, allowing for the couple to conceive a child. I've already posted this video before, but I feel it's the best scene of Meryl from the film, so take another look. Her song begins at 0:59. So, after a lot of fun chasing their items and dreams, life appears good in the "kingdom," until a giant threatens everyone's safety. The setting becomes more dark and somber as sacrifices are made, lives are lost and lessons are learned. I've rationalized that my laziness in describing the plot works as a good incentive to check out the film for yourself! Although if you've bothered to look at this site you're probably already planning on it. Of course Meryl is fantastic in her role. Great combination of interweaving her acting choices with the tricky music that the wonderful Stephen Sondheim has provided. I had already seen "Stay with Me" a number of times, but I was particularly pleased with her rendition of "Last Midnight," as it sort of helped sum up the crux of this arduous adventure each character had endured. Emily Blunt was a treat, as was Anna Kendrick as Cinderella. Both of their big solo numbers were high points for me. As expected the audience favorite was Chris Pine and Billy Magnussen's duet "Agony," playfully performed in and around a river. That Billy can really fill out a pair of leather pants nicely. I mentioned to Scooter that if I weren't familiar with the story that the first half may have been a bit difficult to decipher, as Sondheim's lyrics are very detailed and fast-paced at times. But I thought some of the choices Rob Marshall made in the film helped make things a bit more clear, particularly the back story of the Witch and Baker's father, which was a bit fuzzy to me when originally seeing the stage production on Netflix. As Meryl has said, Into the Woods is "a musical with a brain." It provides a good opportunity for us viewers to reflect on our own motivations, how we choose our own morality, and what we're willing to compromise to get what we want. Having only seen the film once and about 13 hours ago, there's likely a lot of processing to still do, and of course I'll see it again. Maybe I'd have different things to say when I do, but until then, just go see it! At the time of this post, Into the Woods came in second behind Unbroken in the Christmas Day box office with an estimated $15 million (Unbroken around $15.6M). Considering Woods was shown on nearly 700 fewer screens, I'd say that's a damn good start to a long opening weekend. In an interview with cast members Billy Magnussen (Rapunzel's Prince) and Mackenzie Mauzy (Rapunzel), we get to see a couple of brief, albeit new, clips from Into the Woods. I don't think we've seen this scene yet of Meryl as the transformed Witch trying to prevent her daughter from running off with the prince. In theaters nationwide in two days! Joined by Emily Blunt and Anna Kendrick, Meryl was on the Ellen DeGeneres Show this morning promoting Into the Woods. I'm going on Christmas! Several things to discuss in this post. Most notable is that Into the Woods is getting the review treatment since Disney's embargo was lifted two days ago. As I type this, it sits at a very respectable 71% on Rotten Tomatoes with 28 reviews counted, and 69% on Metacritic, with just nine reviews reported. If this film ends up above 70%, I can't imagine the filmmakers being displeased with that. Nothing to suggest these opinions will deter viewers from showing up on Christmas Day. 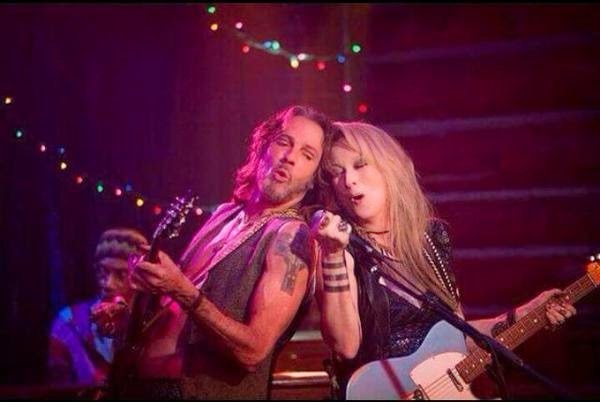 Yesterday a new still was revealed from the filming of Ricki and the Flash. Rockin' it out with costar Rick Springfield. I'm pretty sure they've wrapped production, and the film is set to be released June 26th next year. Finally, it's no secret I'm typically obsessed with the prospect of Meryl's upcoming/rumored projects. I speculated after the untimely death of director Mike Nichols last month on whether or not the HBO project Master Class, which he and Meryl were planning on doing together, was going to move forward. As shooting was set to begin in January, I have to imagine that several aspects of the project were already in place. I still think it's very possible that the entire thing is scrapped, or at least postponed and not to include Meryl. Meryl never appears overweight, but I've also never seen her quite this slight except for when preparing for a role, most recently when she filmed The Devil Wears Prada nine years ago. I don't think she got this thin for Ricki and the Flash, so is she maybe readying herself to portray the famously trim Maria Callas? If so, I'm onto you, Meryl. Variety has revealed that Roadshow Films has purchased a 33% stake in FilmNation, the company that was planning on producing The Good House with Meryl and Robert De Niro. Nary a word has been reported about the development of this project in over a year. I've been bugging Joe for a while now whining that I haven't heard any news about whether it was happening, assuming it had been put to pasture for the unforeseeable future. Well, that still may happen, but a glimmer of hope shines through when a reputable source is quoted as saying "The first two movies scheduled to begin production next year under the new financing structure are The Founder with John Lee Hancock (The Blind Side) directing a biopic of McDonald’s founder Ray Kroc; and The Good House starring Meryl Streep and Robert De Niro and based on Ann Leary’s book." Meryl recently said in an interview that after filming Florence Foster Jenkins next May, she won't be doing anything for a while. Well, what's a while? A year? Six months? If Florence is wrapped by July, it's absolutely possible that Meryl would be ready to film by September or October. I don't imagine either of these films having particularly grueling shooting schedules, and she won't even have to learn a new language or how to play an instrument. Fingers crossed this actually does happen. I really enjoyed the book and would look forward to Meryl teaming with De Niro in a great story. Although I love when she learns challenging new skills for her roles, that of Hildy Good won't have any "gimmicky" aspects to her, i.e a major accent (maybe slightly Bostonian), physical skill or greatly altered appearance. Critics get too distracted by those things (even though they add to the performance), and it irritates me that the marvelous performance Meryl gives is then unnecessarily denounced. Swinton is the only true surprise, but she's been getting a few nods from critics' groups. Not a good sign for Laura Dern (Wild). Streep is in good shape for an Academy Award nomination, with the next major televised show nominations being BAFTA, which will be announced January 9. The Critics' Choice Awards will be presented Thursday, January 15 (the day of the Oscar nominations!). The Hollywood Foreign Press Association has announced its nominations for film and television excellence and as expected, Meryl has been nominated for her role in Into the Woods. This comes off the heels of her SAG nomination just yesterday. This puts her in very good standing for an Academy Award nomination next month. Streep currently holds the record for Globe wins with eight. A full list of nominees can be seen here. The Golden Globe Awards will be presented Sunday, January 11. As expected, Meryl was recognized by the Screen Actors Guild this morning with a nomination for Best Actress in a Supporting Role for her performance as the Witch in Into the Woods. This brings her SAG nominations total to a whopping 16. Congratulations, Meryl. I was a bit disappointed to see that the cast for Into the Woods wasn't also recognized for best ensemble, but of course I'd rather Meryl be nominated than the other way around. A few surprises: Naomi Watts sort of came out of nowhere with her supporting role in St. Vincent, as did Jennifer Aniston in Cake. Robert Duvall in The Judge and Jake Gyllenhaal for Nightcrawler also weren't expected among most, but all four were certainly in the conversation on many prognosticators' lists. The full list of nominees can be seen here. The SAG awards will air simultaneously on TBS/TNT on Sunday, January 25. Laura Dern could very well sneak into the fifth slot for her role in Wild, with a smaller chance for Carmen Ejogo in Selma. I'll add my Golden Globe predictions (which are announced Thursday) tomorrow after SAG announcements are made. In related news, yesterday was the world premiere of Into the Woods, with Meryl present on the red carpet. She's looking pretty good these days. Not really much to add to the interview, but as usual, some lovely pearls of wisdom from Miss Meryl. Broadway World has revealed a new featurette with a clip of Anna Kendrick singing "On the Steps of the Palace." Also, Meryl did her second morning show in two days, stopping by to have a visit and talk about Into the Woods (among other things) on LIVE with Kelly and Michael. Nice to see an extended look at her first scene in the film. 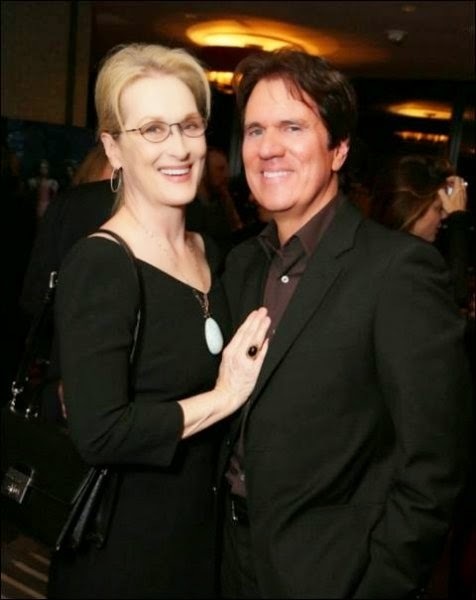 And Meryl looks so pretty in this interview! New clip of Anna Kendrick singing "On the Steps of the Palace" being debuted tomorrow.